Stores Ref. 15A/156 (pack alone) or 15A/141 (with canopy). 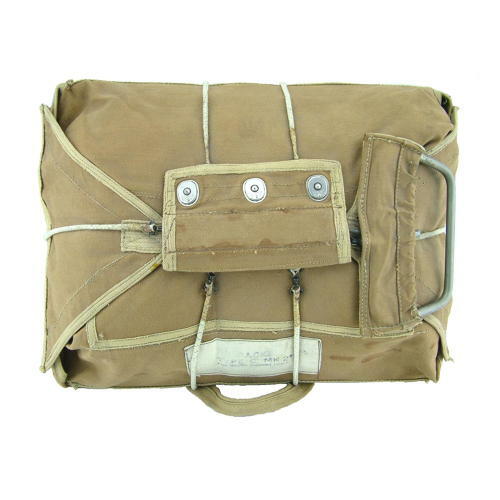 Two point quick connector chest pack. Attaches to the Observer type harness by the engagement of a pair of steel loops with a pair of hooded snap-hooks located on the chest. This example is manufactured in the usual sandy coloured plain weave duck canvas. It is complete with all the webbing grab handles, rip-cord flap and rip-cord handle housing. There is a faded label marked 'PACK TYPE C, MK.2 FOR NYLON RIGGING LINES'. The remaining text/numbers are illegible. The pack is generally quite clean apart from a few stains and in very good condition. It is fitted with a full set of bungee cords and ripcord/handle. No canopy is fitted and the pack has been packed out for photographing. It will be sent empty to reduce weight/bulk. We can supply the 'rings' required to fit the pack to a harness at extra cost (you would need to find or fabricate metal plates to use them). Although a post WW2 issue pack these are still difficult to find and would make an excellent display piece in lieu of a wartime example. Stock code M22661.